Maze hooks mean no more storage hang-ups! We know just the place for the funkiest hooks in town, so the million dollar storage question is this. If you’ve no room to shelve it, have you considered hanging it? 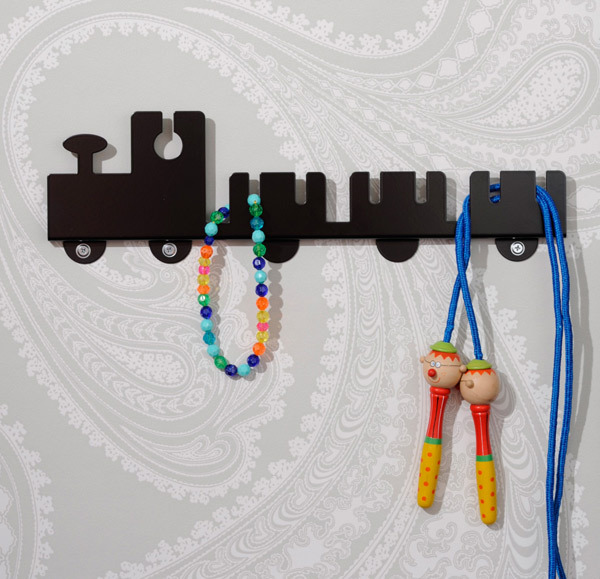 Funkis is host to all things stylishly functional and fabulously Swedish – and that includes these gorgeous hooks, designed by talented artists for innovative interiors band, Maze. Perfect for young children’s spaces are the Maze The Ark Taxy hook and the Maze The Ark Ducky Hook, both priced $31 each. Older children will surely love the funky Maze Happy Shelf, priced $85, which is big enough for a well organised homework space or simply to hold all your child’s most treasured belongings. The one that has me particularly hooked is the Maze Tut Tut hook (pictured above). Available in red, white or black it’s priced $65 and it will set any train lover’s heart aflutter. For all your hook needs, be sure to check out all of the Maze collection locally at Funkis.